Peter here filling in for Brandon since he's on a flight to Taiwan for the book expo. Below you'll find most of Brandon's convention schedule for 2012. There might be a couple more one-day stop-ins with Utah conferences, and we're waiting to hear back about an invitation to an autumn convention somewhere in Canada. April will be Brandon's first visit to Australia. Swancon and Supanova have pooled resources to fly him out, so we hope Australian readers can send them the message that this was a good idea by attending in droves. This week's Writing Excuses podcast episode talks about sensory writing with Sam Sykes, and there's an ALCATRAZ annotation talking about the lack of a map in the book. Notes: Brandon is a guest of Fantasy Foundation. Schedule: Brandon will be there Friday and Saturday only. There will be a live recording of Writing Excuses at 2:00 on Friday, and Brandon is currently scheduled to be on panels at 11:00 and 2:00 on Saturday. Notes: Remember that this year, LTUE will be held at UVU. Notes: Brandon is International Guest of Honor. Notes: Brandon is an instructor alongside Kevin J. Anderson, David Farland, Rebecca Moesta, and Eric Flint, with special guest speakers Kristine Kathryn Rusch & Dean Wesley Smith. Prices go up April 1, 2012. Notes: Brandon is a Guest of Honor. The official con name this year is BayCon 2012: Pleasure Cruise, but we're pretty sure there is no actual cruise involved. Dates: July 12–15, 2012. Preview night July 11. Notes: Brandon is a Special Guest. Notes: Brandon will be a Guest of Honor. This is a small convention and in recent years memberships have been close to selling out in advance, so preregistration is strongly recommended. Address: Various hotels in the Peachtree Center area. See the website. In this week's Writing Excuses podcast episode, Dan, Mary, Howard, and I talk about brevity. Since all the chapters of my abandoned novel MYTHWALKER have now been uploaded, it's time to start dishing out something else for your weekly bonus content. So my assistant has put up the first annotation for ALCATRAZ VERSUS THE EVIL LIBRARIANS. This one talks about the process of coming up with the title for the book, with the various (and often ridiculously long) options that were considered. My assistant also uploaded another Twitter posts archive. The leatherbound Wheel of Time charity auction for Worldbuilders is currently at $1,725.00. Wow! I believe there are still slots available for the Magic the Gathering: Dark Ascension prerelease in West Valley this Friday. They don't count a slot as filled until you prepay, so give them a call. Hey, all. The new Magic the Gathering set is coming out in a little while, and the prerelease is this weekend. Dan and I had a lot of fun at the prerelease last time, so we’re going to be doing it again—with a twist. We will do an 18-person tournament, not including Dan and me. (So, 20 people.) As 12 of the 18 people play games against one another, Dan and I will team up against the six others in an Archenemy game with both Dan and me as the archenemies. Then, when those games are done, the six who played us will rotate out and six others will come in to play against us. And then, not surprisingly, we’ll play the last six. Day: The night of Friday the 27th of January. What: 18-person Sealed Deck tournament, with special games against Brandon and Dan. Every year for the past several years, NAME OF THE WIND and THE WISE MAN'S FEAR author (and good buddy of mine) Patrick Rothfuss has run a charity drive where he matches at 50% donations to Heifer International through his Worldbuilders team page. Everyone who enters the general drawing gets a chance at a huge number of prizes. There are also individual auctions on several of the most desirable items. Pat explains it best. I've donated various books to the prize pool before, and this year I and Badali Jewelry have teamed up to donate a special Wheel of Time package to the auctions. 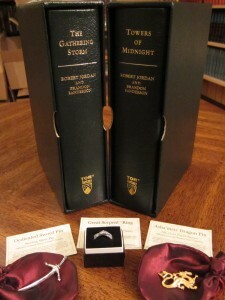 My contribution is from among my personal leatherbound copies of THE GATHERING STORM and TOWERS OF MIDNIGHT. With each Wheel of Time book that is released, Tor puts out a limited edition of 126 signed copies, 100 of them numbered for commercial release, and 26 of them lettered for publisher and author use. I received copies B and S of both books, and I'm donating the matched set of S copies. Please see Pat's description below. The auction itself is here, and you can see the other auction items here. And remember, for every 10 dollars you donate on the Worldbuilders Team Page, you get a chance to win a book from the general prize pool. AUCTION: signed, leather-bound copies of The Gathering Storm and Towers of Midnight by Robert Jordan and Brandon Sanderson with Wheel of Time jewelry. These gorgeous gold-lettered books are leather-bound and designated "S" out of 26 lettered copies. The books come in their own matching leather slipcase, feature a facsimile of Robert Jordan's signature, and are signed by Brandon Sanderson. In addition to these stunning best-selling books, this auction includes three lovely pieces of jewelry inspired by Jordan's series: an Asha'man Dragon Pin, a Dedicated Sword Pin, and a Great Serpent Ring. We are very grateful to Brandon Sanderson for his donation of these rare books, and to the folks at Badali for making things even sweeter with the addition of the jewelry. To see more pictures of these gorgeous books, or to place a bid on the auction, click here. My assistant put up another chapter of my abandoned 2001 novel MYTHWALKER. This one is exciting. There's just one chapter left. In this week's Writing Excuses episode, Dan, Mary, Howard and I talk about worldbuilding flora and fauna. Check it out. It's award nomination season again, so here's a quick reminder of what I've released that's eligible this year. You can nominate at this link by March 11th, 2012, if you are a member of the 2011 (Reno), 2012 (Chicago), or 2013 (San Antonio) World Science Fiction Conventions by January 31st, 2012. For more information on how the Hugo Award works, see my breakdown last year. My fiction is additionally eligible to be nominated for a Nebula Award by February 15th, 2012, if you happen to be a member of the Science Fiction and Fantasy Writers of America. I've also learned that THE ALLOY OF LAW is on the long list of nominees for this year's David Gemmell Legend Award, and the first round of voting is open now and runs through March 31st. Last year The Way of Kings won the award, to my great pleasure, so I already have the awesome battleaxe. Please vote for the book you think deserves it this year. Plus I have a vested interest in the nominations of Dan Wells, Mary Robinette Kowal, and Howard Tayler, my Writing Excuses partners (aside from my brother Producer Jordo, whose only eligible work is Writing Excuses itself). Last year Mary won the Best Short Story Hugo for "For Want of a Nail," but Howard and Dan were defeated by worthy opponents in their categories. This year Dan is eligible with I DON'T WANT TO KILL YOU and A NIGHT OF BLACKER DARKNESS for Best Novel and "The Mountain of the Lord" in MORMONS & MONSTERS for Best Novella, Howard with SCHLOCK MERCENARY: FORCE MULTIPLICATION and "Deus Ex Nauseum" from SCHLOCK MERCENARY: EMPEROR PIUS DEI for Best Graphic Story, and Mary with "Goodhouse Keeping" from COURTS OF THE FEY for Best Short Story, "Kiss Me Twice" from the June 2011 ASIMOV'S for Best Novella, and "Whatnot" (a puppet play performed at the 2011 Worldcon) for Best Dramatic Presentation, Short Form. Forum member FeatherWriter posted this image of the Soulcaster that her mother made her for Christmas. Cool! Season 7 of the writing advice podcast Writing Excuses that I do with Mary Robinette Kowal, Howard Tayler, and Dan Wells has just kicked off. In the first episode, we talk about when good characters go bad. My assistant also uploaded another chapter of my abandoned 2001 novel MYTHWALKER. There are three chapters left.